The sales reports provide users with an overview of the various sales analyses. In this article, we will break down the sections of the reports and explain what each one does. Sales reports are located at Reports > Sales Dashboard. From here you will see the sections listed below. This dashboard provides you with a quick-look summary of sales statistics for your store. This allows you to see the top products and categories, top customers, and total period sales. Using the filters, you can specify date ranges for specific stores. Just specify the store, select the ranges that you need and click Filter. This generates an in-depth analysis of your sales aggregated by many different data points. 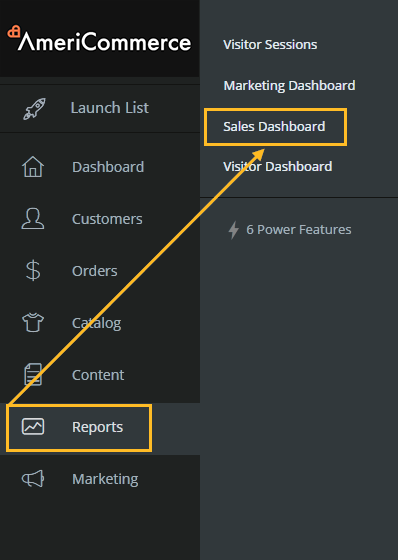 Use the Customize Your Report button to choose which columns to display. 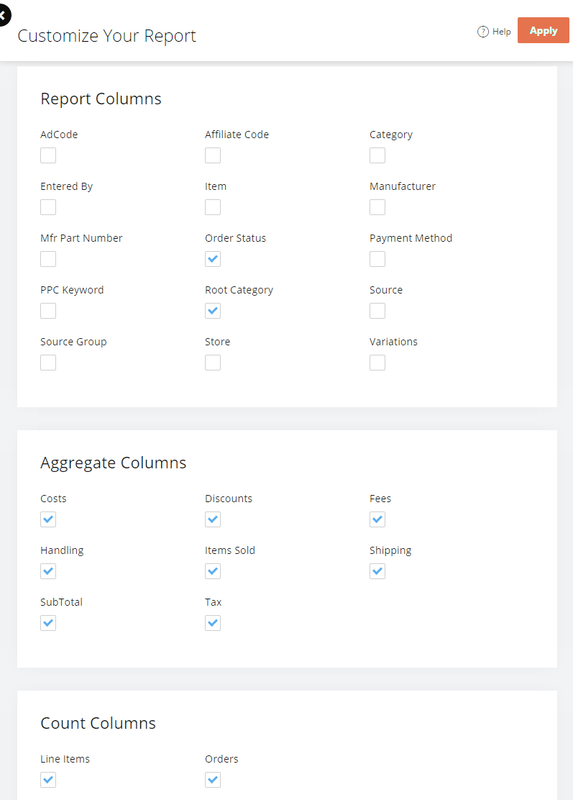 From here you can customize your Report Columns, Aggregate Columns and Count Columns. After you have made your selections, press save in the top, right corner. Aggregate columns calculate the sum of that particular field, based on the combination of columns chosen. For example, if you choose report columns of Root Category and Item with aggregate columns of Costs and Subtotal, the report generated will consist of the total sum costs and order subtotals for all combinations of root category and item. This is a powerful tool that allows you to analyze sales statistics by specific criteria. These reports generate by analyzing your order history. This report allows you to see all sales broken out by your stores categories. You can click the "+" icon next to a category to see all the items and get item specific sales totals for that category. This allows you to see which sections of your catalog are generating the most revenue for your store. This report shows aggregated totals for sales tax and shipping charges on a yearly basis. You can expand a particular year by clicking the "+" icon next to it to see a monthly breakdown. You can also see aggregated order amounts such as total discounts and handling fees. This report allows you to see carts that customers have made yet not completed the order process. You can analyze why customers are not ordering these carts, and work to help your customers in completing their orders. This article will teach you how to configure settings related to abandoned carts. This report forecasts inventory requirements for subscriptions that will be renewing in a designated number of days. You can use the Customize Your Report to select which columns to display. The available report columns are Item Count, Item Number and Renewal Date.